Potential structural and contact targets identified. Historical reconnaissance sampling indicated anomalism over key structural targets. Field reconnaissance indicates shallower cover than previously thought. Additional potential domal structure across PL210/2017. The Senyetse and Okwa Projects comprises three prospecting licenses over a 1,830.5km2 area, approximately 54km east of Ghanzi (Senyetse) and 59km south east of Ghanzi (Okwa). The Senyetse and Okwa projects are located via the via the Ghanzi/Maun Highway and proximal to the Trans Kalahari Highway, Ghanzi/Gaborone Highway and Maun/Ghanzi Project. Bamangwato Concessions Ltd (BCL) soil sampling program over sections of the Senyetse prospecting licence area. Metallum completes Global Exploration Technologies (GET) acquisition and its Botswana project portfolio. S1 Prospect historical anomaly confirmed by recent soil sampling program. 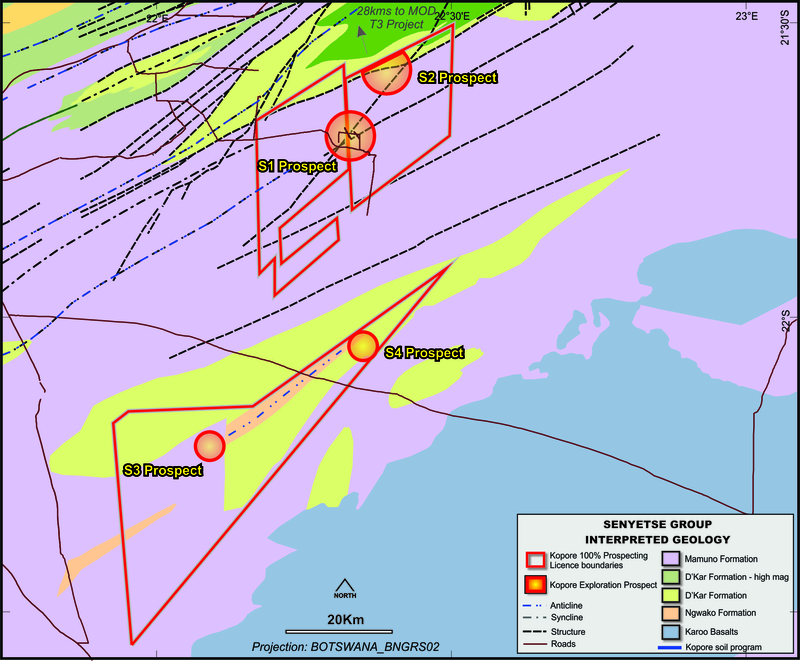 Two copper/zinc soil anomalies have been identified across interpreted geological contacts and cross-cutting geological structure. A total of five lines spaced at 1km apart were sampled at 25m and assayed every 50m for a total of 176 soil samples. Kopore’s technical team secured a historical airborne magnetic survey raw data file, which has been reprocessed by Perth based Geophysicist Mr Kim Frankcombe. This information has allowed the Company to refine its targeting and demonstrate the presence of the D’Kar Formation at the GWD1 Prospect. The D’Kar Formation is known to host the copper-silver mineralisation across the Kalahari Copper Belt. RC and Diamond Drilling Programs. © 2019 Kopore Metals Limited. Site by aWhite Design.